On this 10-day vacation, we’ve arranged your hotel reservations, daily breakfast, sightseeing, transportation between the cities, and transfers to/from the train stations. Plus, you’ll have a Local Host® in each city, someone who is there for you to answer questions, offer insights, and help ensure your vacation is everything you want it to be. Your vacation begins the moment you arrive in Amsterdam, as we can pick you up from the airport and whisk you seamlessly to your hotel. Here, your Local Host will greet you with a welcome and materials to help you get settled. The next day, after included breakfast, we’ll pick you up at your hotel for guided sightseeing with a local expert that includes a cruise by glass-roof boat through Amsterdam’s canals. There is no better way to see the houses built during Holland’s Golden Age, its fascinating houseboats, and famous bridges. We’ve also arranged for you to visit a diamond center to learn about how the gems played an important role in the city’s history, and the Rijksmuseum, where you’ll see masterpieces by Rembrandt and other Dutch masters. During your free day in Amsterdam, you’ll have time to explore on your own (with the support of your Local Host, of course). You may want to visit the Van Gogh Museum, take a dinner cruise along the canals, or visit the Anne Frank House. Then, its off via high-speed train to Paris. We’ve arranged for guided sightseeing with a local expert in Paris that includes the must-see attractions, such as the Arc de Triomphe. We’ll also take you to Notre Dame Cathedral, where you’ll see its amazing 13th-century, stained-glass windows. The Louvre is the world’s most visited museum and houses some of the world’s best treasures. We’ll take you to the Louvre, where you’ll see Da Vinci’s Mona Lisa and other masterpieces. During your free day in Paris, you may want to take an excursion to the Palace of Versailles or to Monet’s Giverny. Or maybe shop at the famous Galeries Lafayette, where we have included shopping discounts, or just relax at a café on the famous Champs-Elysées. Next, you are off via the high-speed Eurostar train to London. You’ll have the thrill of traveling through the Channel, an engineering marvel! In London, your exclusive sightseeing with a local expert includes London’s famous landmarks, such as Big Ben and Westminster Abbey, where Prince William and Kate Middleton were married. We’ll also take you to St. Paul’s Cathedral with its iconic dome and long, fascinating history, before arriving in time for the Changing of the Guard at Buckingham Palace. Your expert Local Guide will share insider stories that only locals know. During your leisure day in London, you may want to take an excursion to mysterious Stonehenge; shop at one of the famous department stores, such as Harrods or Selfridges; take in a West End show such as Mama Mia, Wicked, or Billy Elliot (your Local Host can get tickets for you); or grab an ale at a local pub. And did we mention that our sightseeing includes VIP access to the attractions? This means that rather than being like all the other tourists waiting in line outside, you’ll be up close and personal with the attractions. Wouldn’t you rather be gazing at the Louvre’s treasures and enjoying the Rijksmuseum’s masterpieces than wasting time waiting in line? At Monograms, our goal is to make your vacation as enjoyable and easy as possible. That’s why we’ve included VIP access and why we’ve arranged your transportation, transfers, guides, sightseeing, hotels, and breakfasts. Add the comfort of knowing you’ll have a Local Host in each city to translate for you, answer questions, and help you arrange activities, and you’ve got a dream vacation. Guided sightseeing; inside visits and special features are shown in UPPERCASE. ALSO INCLUDED: shopping discounts in Paris at the famous Galeries Lafayette. 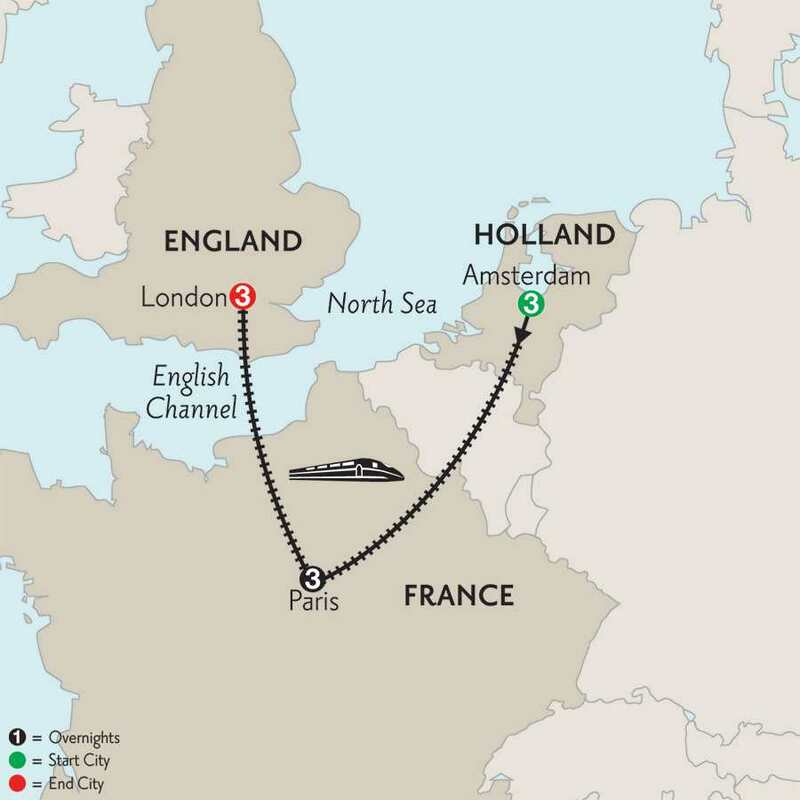 Your package includes first-class tickets on the high-speed Thalys train from Amsterdam to Paris. We’ve even included transfers from/to your hotels to/from the train stations. Welkom to the Dutch capital! Your Local Host will help you maximize your time in the city that has almost as many bikes as residents. Morning guided sightseeing includes a CRUISE by glass-roofed boat through Amsterdam’s canals, where you’ll glide past traditional gable-roofed homes, fascinating houseboats, and the Westerkerk (Western Church). Take photos of the Anne Frank House, Magere Brug (Skinny Bridge), and the Blauwbrug (Blue Bridge). Visit a DIAMOND CENTER and learn how these precious stones played such an important part in local history. Admire the splendid works of Rembrandt and other Dutch masters at the world-renowned RIJKSMUSEUM. During this day at leisure your Local Host can offer suggestions for things to see and do—like an excursion to The Hague and Madurodam; a unique dinner cruise along the city’s fascinating canals; or a visit to the Van Gogh Museum. Travel by HIGH-SPEED THALYS TRAIN (First class) to Paris. Morning guided sightseeing takes you to NOTRE DAME CATHEDRAL, where Napoleon was crowned emperor in 1804, to admire its amazing 13th-century stained-glass Rose Window. Pass the Latin Quarter, Les Invalides, the Opéra, Place de la Concorde, and Arc de Triomphe. Drive by the Seine River with its beautiful bridges, and along the fashionable Champs-Elysées. Stop to take photos of the iconic Eiffel Tower from one of the best panoramic viewing points. Also enter the world’s most visited museum, THE LOUVRE with its modern glass pyramid, to see Da Vinci’s Mona Lisa and other treasures. Your Local Host can help you plan your day in the “City of Light.” You may want to take an excursion to Louis XIV’s lavish Versailles, Monet’s Giverny, or try a walking route of the Montmartre district, where artists such as Picasso and Van Gogh worked. Morning guided sightseeing includes all of London’s famous landmarks. Drive past the Houses of Parliament and Big Ben; Westminster Abbey, where Prince William and Kate Middleton were married; Whitehall’s mounted horseguards; the Prime Minister’s Downing Street; and Piccadilly Circus. Take photographs of the London Eye, the giant Ferris wheel situated on the riverbank, and the Shard, the tallest building in Western Europe. Visit ST. PAUL’S CATHEDRAL. Sir Christopher Wren’s masterpiece with its world-famous dome is an iconic feature of London’s skyline, and the awe-inspiring interior holds fascinating stories about its history. The final highlight is the ceremonial pageantry of the Changing of the Guard (if held). Full day at leisure. Ask your Local Hosts for suggestions—on how to get to Madame Tussauds, the celebrity wax figure exhibition; or Windsor Castle, the oldest and largest occupied castle in the world, for a visit of the magnificent State Apartments.